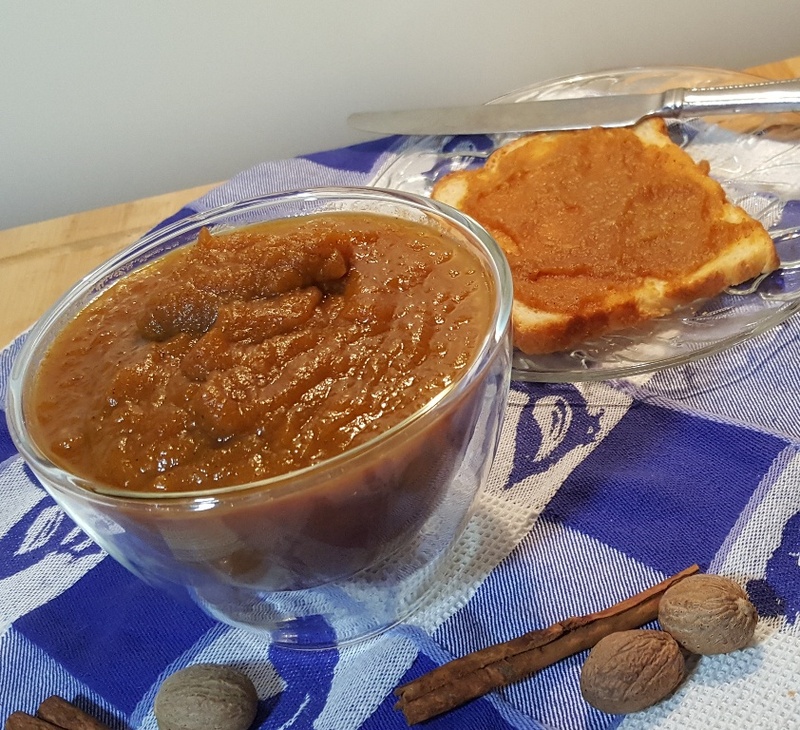 Pressure Cooker Pumpkin Apple Butter will remind you Fall is here with the delicious aroma of Autumn spices, including nutmeg, cinnamon and ginger. Fall is here again and that means lots of pumpkin, apples, spices and cranberries. It is the start of the Holiday Season. In the colder areas, leaves are changing colors and tank tops and shorts are being packed away. 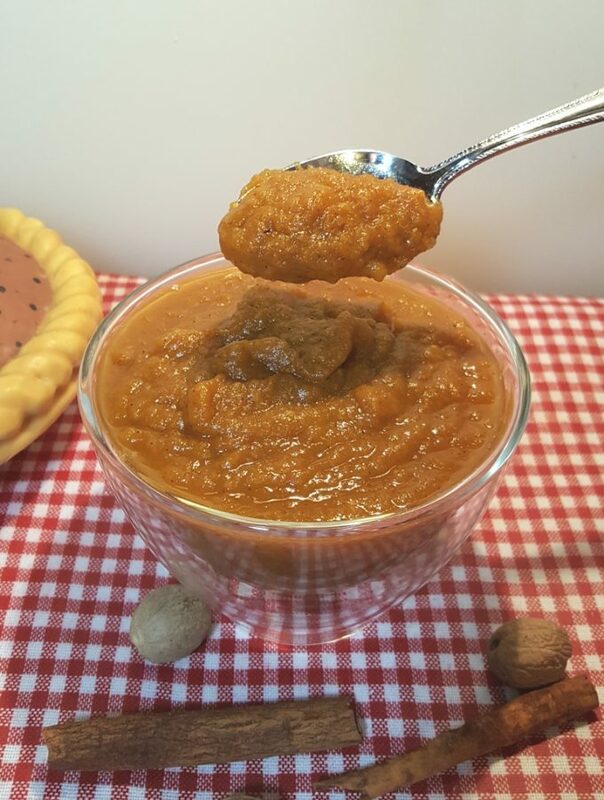 Terri Hopkins, who follows my This Old Gal Facebook page, sent me a message, asking if I would convert her favorite Vegan Pumpkin-Apple Butter for her, so that she could make it in her Pressure Cooker. The recipe is from Fat Free Vegan Kitchen. For this recipe, you can easily cook your own Pressure Cooker Pie Pumpkin Puree or Cushaw Squash (which some people use in place of Pumpkin). Cushaw is a more solid squash than Pumpkin. Since this recipe is for the Pressure Cooker and Pressure Cookers need liquid steam to work, I went with real Pumpkin Puree. 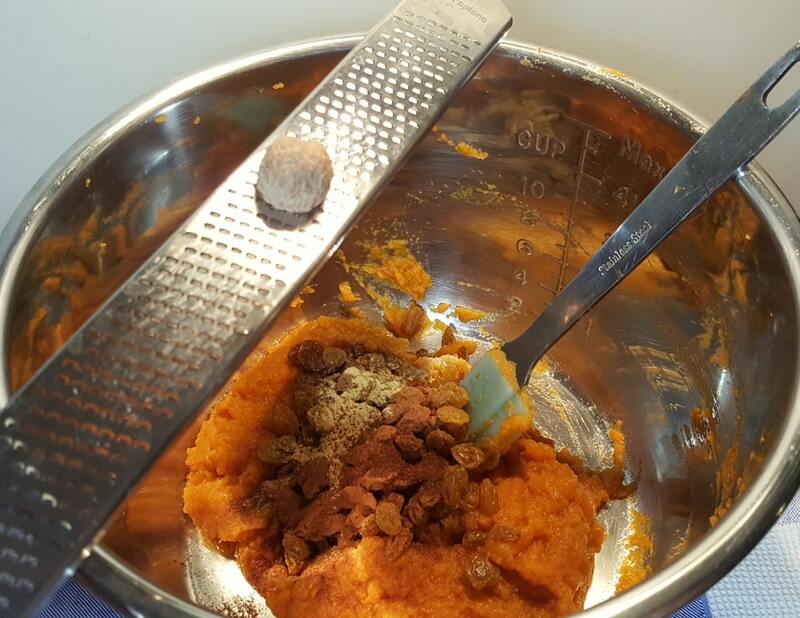 It is so easy to make your own Pumpkin Puree and I make a ton and use my Foodsaver to freeze in 15 oz batches, so that I have fresh Pumpkin Puree throughout the year. A can of Pure Pumpkin Puree will also work for this recipe. In the original recipe, Susan used apple juice to first plump her Golden Raisins. For this Pressure Cooker Pumpkin Apple Butter recipe, we’ll just toss almost everything into the Pressure Cooker. Susan’s recipe uses quite a bit of Nutmeg. For my tastes, just a quick Dusting of Nutmeg is good. More can always be added later. 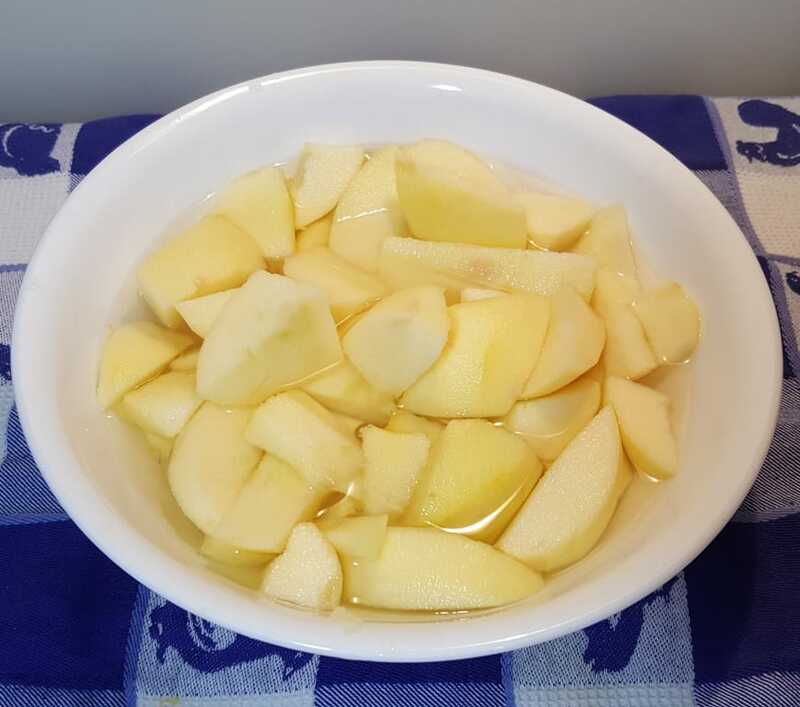 Susan also used apple juice and apple sauce instead of fresh apples. That is fine, however, we are using a Pressure Cooker, so let’s use fresh apples. They are juicy and delicious and will process up in no time! So, depending on how juicy your apples are, you may have to add a bit of apple juice. 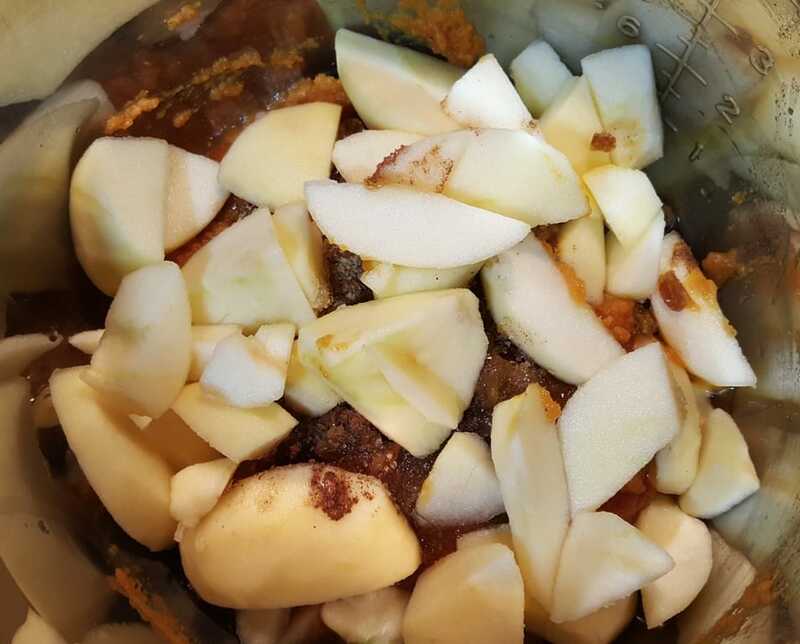 When I make my Pressure Cooker Dannon Dutch Apple Yogurt Compote, I add zero liquid, as the sugar will break down the apples and lots of liquid will release. The apples I used in this recipe, were not every juicy and I needed to add about 1/4 cup of apple juice. I love Braeburn and Honey Crisp apples the best. Use your favorite apples for this recipe. Taste a little piece to determine if they are juicy or mealy. If they are a little mealy or dry, you will need to add in some liquid, apple juice. 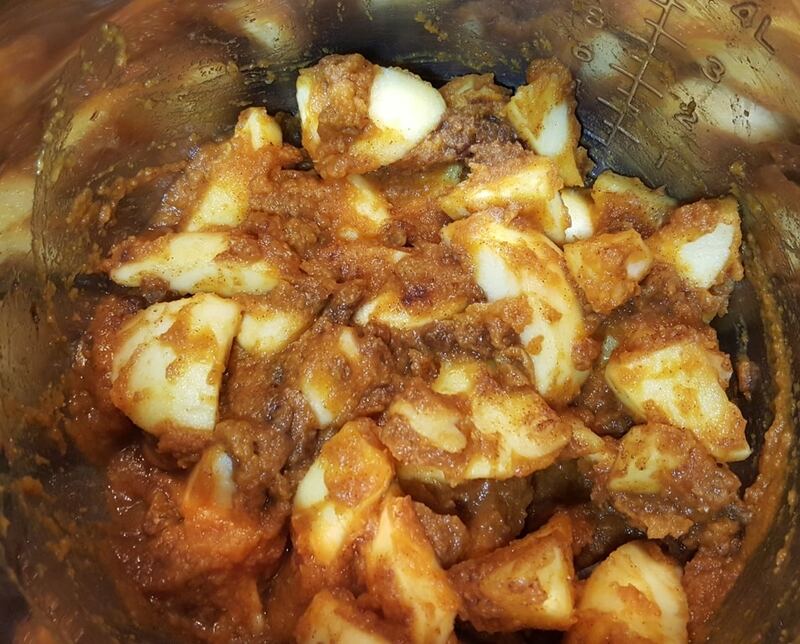 Toss the apples into your Pressure Cooker cooking pot and add the juice, if needed. Mix everything together and you are ready to cook. Leave out the Agave Nectar until after pressure is released. It is thick and will interfere with the Pressure Cooker coming up to pressure. The apples are mostly broken down. I like a very smooth Butter, so after adding the Agave, we will use the Immersion Blender. 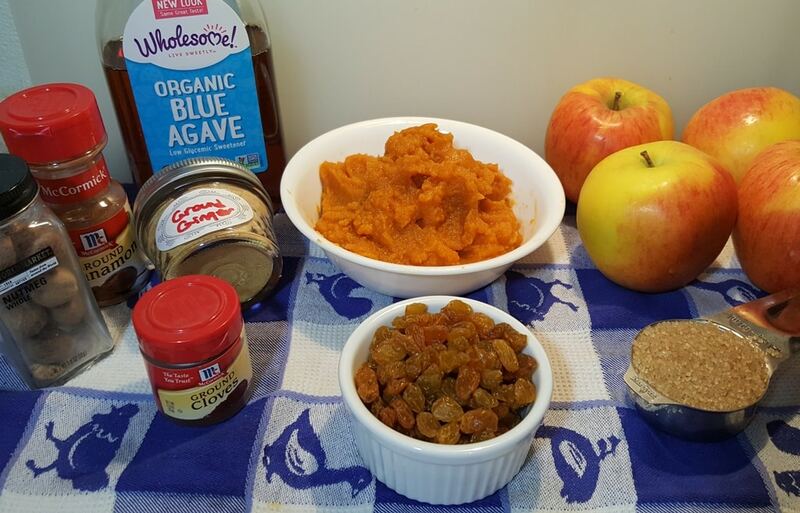 Add about a quarter cup of Agave Nectar to your Pressure Cooker Pumpkin Apple Butter. If you prefer Molasses or another sweetener, that is fine. Just what works for your taste. 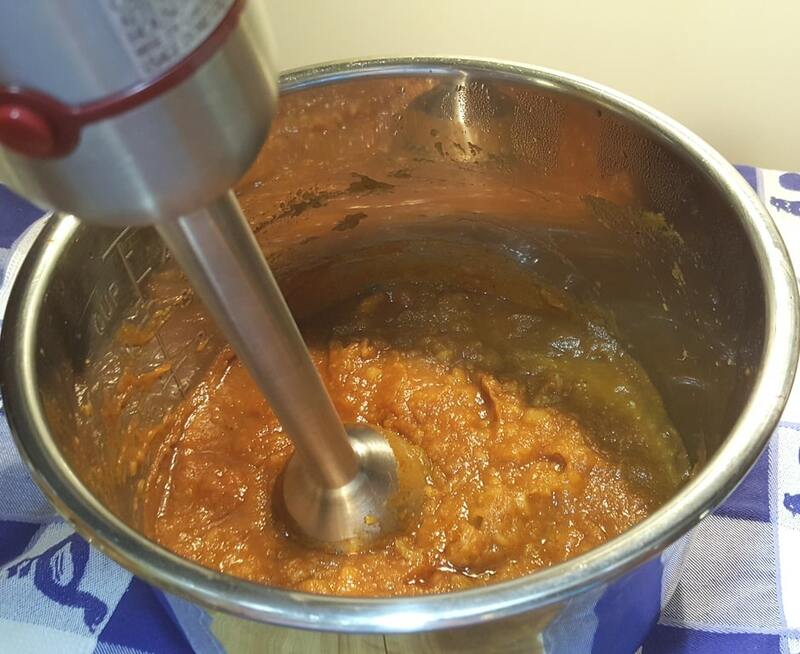 You can use a VitaMix or an Immersion Blender to process the Pumpkin Apple Butter. My husband was using my VitaMix to make Hummingbird nectar, so I used my Immersion Blender. We have three Hummingbird Feeders with about 8-20 Hummingbirds dining with us, daily. Do a taste test and adjust the sweetness and/or spices. Nutmeg is super strong and I like to start out with just a slight dusting. You can always add more….. I am loving my new Foodsaver. There are so many goodies that I love, but aren’t available all year long. 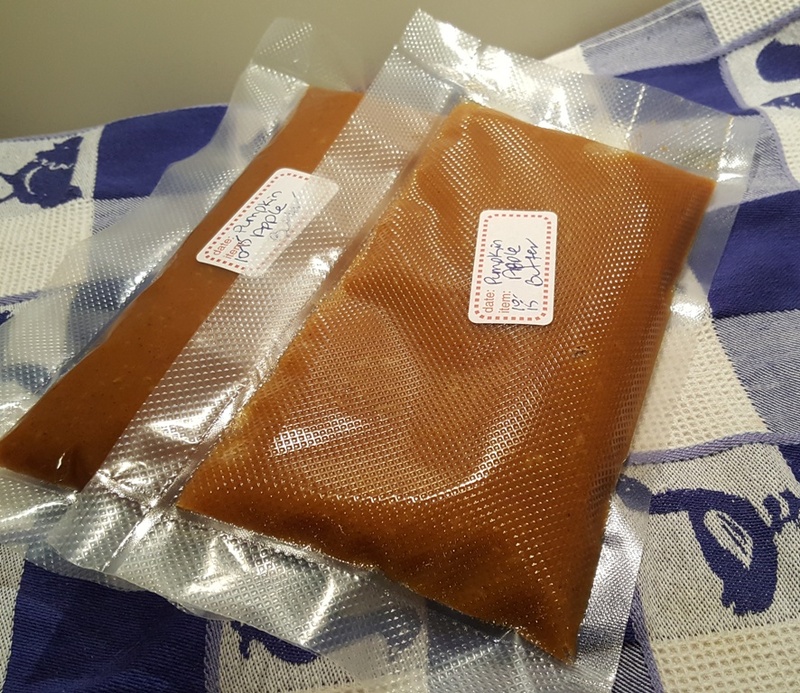 I am able to seasonal items, like Pressure Cooker Pumpkin Apple Butter and freeze them for use throughout the year. I was recommending Retainers for freezing leftovers, but the Foodsaver is so wonderful and I can pack so much more in my freezer. I still do, however, recommend the Retainers for food storage in the refrigerator. 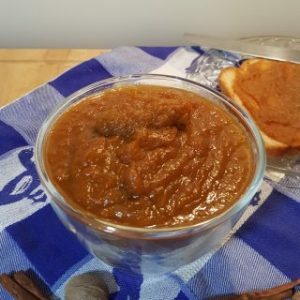 This Pressure Cooker Pumpkin Apple Butter is delicious on toast and with Thick Instant Pot Greek Yogurt. It is also pretty darn good over ice cream and vanilla cake! Add all ingredients, except for Agave Nectar to the Pressure Cooker cooking pot. If your apples are on the dry side, add a bit more apple juice. Cook at High Pressure for 3 minutes. When Beep sounds, allow a 15 minute Natural Release. Add Agave Nectar and mix through. Use an Immersion Blender to process until smooth. Taste and adjust sweetness and spices, as desired. 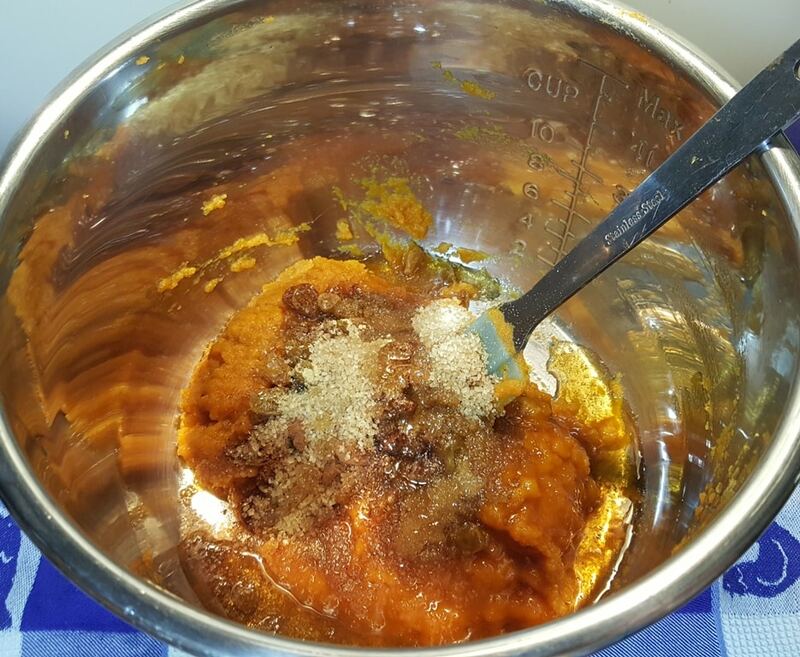 If a thicker consistency is preferred, simmer until thickness is achieved. 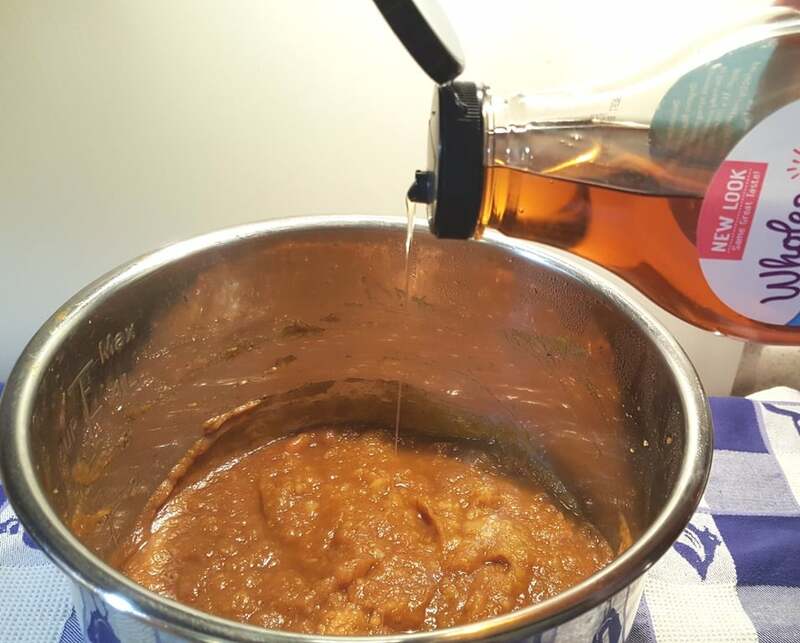 PIN this Pressure Cooker Pumpkin Apple Butter! Is there a purpose for the raisins, other than that some people like them? Do you think I could leave them out? Kathleen, the raisins are used for the sweetness, rather than extra sugar. They totally break down and you won’t know they are there. Just made this. It’s delicious. I used honey to sweeten as I don’t have Agave. Not even sure I can buy it in Ireland. 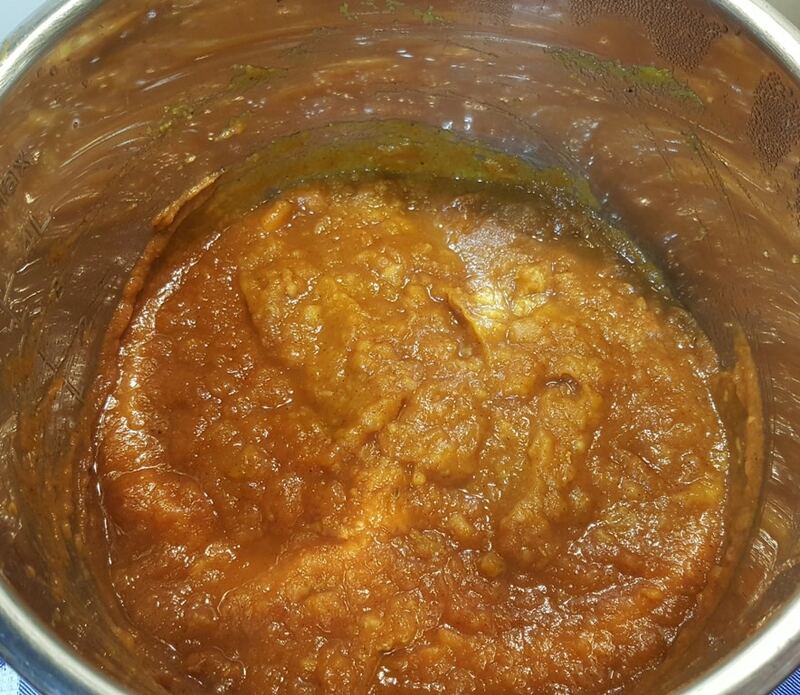 How did you get the food saver to seal without the liquidy pumpkin butter to ooze out during the vacuum? Do you think dark raisins will ruin taste? Hi Bridget. I have my Foodsaver up on a tall cutting board, so that the pouch will fall lower and keep the liquid lower. Dark raisins will definitely change the color, not so much the taste. Brilliant idea to raise height of The foodsaver? Can you can this too? Do you know if this recipe is shelf stable if I canned it? I didnt have apple juice or raisins on hand so I used cranberry juice and sweetened cranberries instead . The flavor is awesome!! Oh mu, this pumpkin butter is wonderful! I skipped the sugar and sweetened lightly with maple syrup at the end. Soooo good! I use many TOG recipes for IP and they are delicious every time! Didn’t come up to Pressure even with an extra cup of apple cider. Ended up slow cooking it. Bummer.